This comfortable and inviting three bedroom apartment is set in a quiet location and just a shortstroll to Clarkes beach. All comforts are included in this fabulous ground floor unit including air conditioning,ceiling fans,a spacious and well equipped kitchen, and a large flat screen TV. There are three generous bedrooms and two bathrooms in the unit. The main bathroom contains a luxurious spa bath sure to melt away any aches and pains. The apartment's open plan kitchen, dining, and lounge area opens onto a north facing covered verandah overlooking the sparkling pool and surrounded by beautifully manicured gardens. An ideal spot to unwind with family and friends after a long day in the surf and sand. 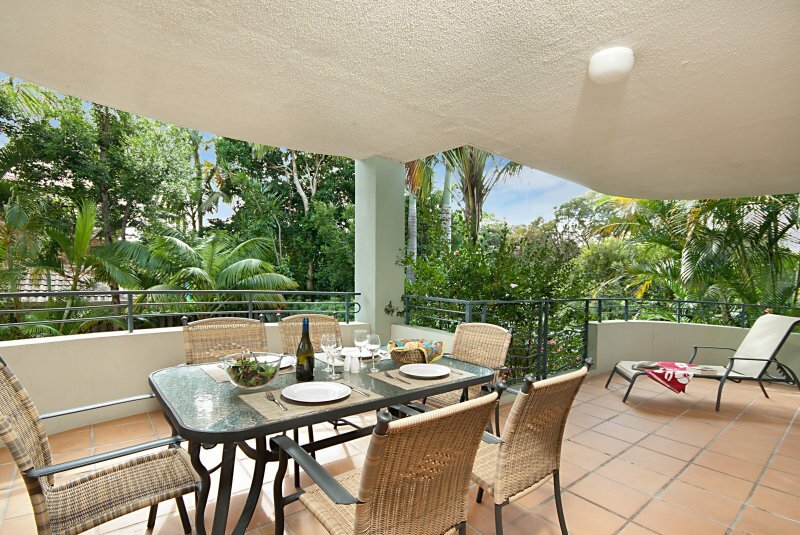 The apartment is located approximately 800 metres from Clarkes Beach through a nature reserve and about 1km into Byron town centre.